Just the adults from a John's Pass Beach family portrait session - Nikon D300 Tamron 17-50mm @ f/5.6 ISO 200 1/60th - Strobist: SB-800 to frame left & SB-600 to frame rightThe weather was fine all day as I made my way to the beach at John's Pass to meet a 12-person family all from Canada for family beach portraits. However, once on the beach there were storm clouds everywhere to the south, west and north, but none passed over until the shoot was finished. Lucky again! In this shoot I really tried to stress avoiding just having people line up side by side (the picket fence look) and asked for more hands on interaction, like in the above shot. I placed the man in the pink shirt on the sand first, and then had everyone else stack on top of him. 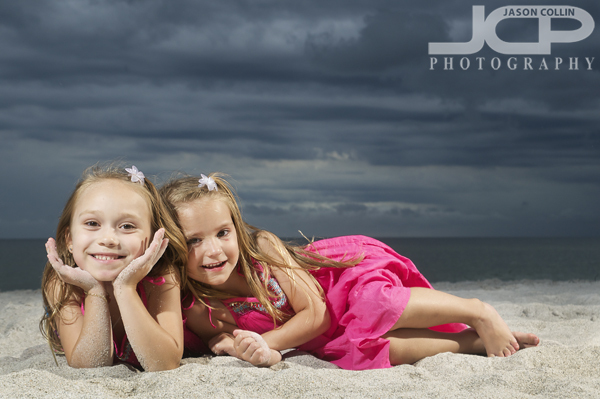 Sisters having fun on Madeira Beach Florida - Nikon D300 Tamron 17-50mm @ f/7.1 ISO 200 1/60th - Strobist: SB-800 to frame left & SB-600 to frame rightThese sisters needed no prompting to take up a more fun pose on the beach. The challenge with them was getting them to do something not too crazy with each other! 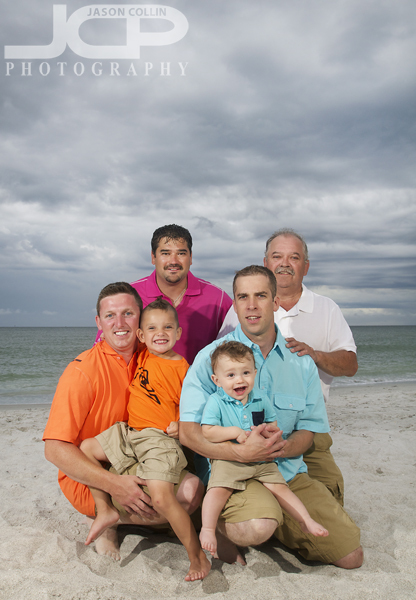 Just the boys during this Madeira Beach family portrait session - Nikon D300 Tamron 17-50mm @ f/7.1 ISO 200 1/60th - Strobist: SB-800 to frame left & SB-600 to frame rightOnly the guys in this shot and the best way to keep two active boys under somewhat control is to have them under wraps! 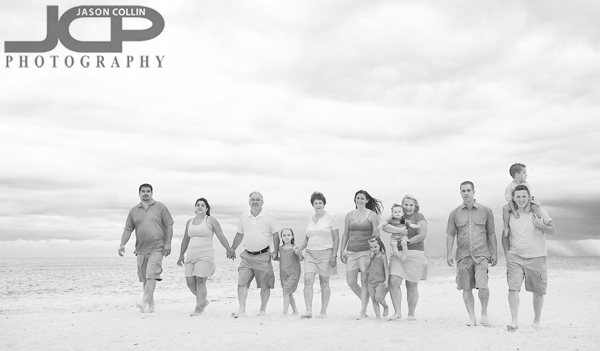 All twelve family members walking down Madeira Beach at John's Pass Florida - Nikon D300 Tamron 17-50mm @ f/4 ISO 800 1/500thThe whole 12-person family walking down the beach. Overlap by someone walking too fast is a concern in these shots, so I instructed everyone to walk at the same pace and not get in front of each other. By the second take they had gotten it down. Cousins all stacked up on Madeira Beach family portraits Florida - Nikon D300 Tamron 17-50mm @ f/7.1 ISO 200 1/60th - Strobist: SB-800 to frame left & SB-600 to frame rightNothing like a small stack of cousins as the kids when on their own in front of the lens seemed to be more willing to smile and stay put. 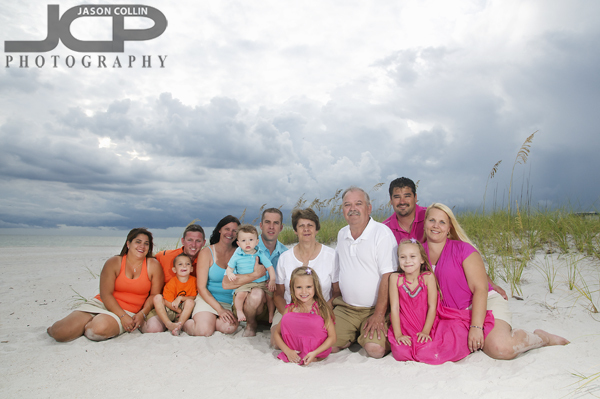 The whole family portrait all 12 on Madeira Beach Florida - Nikon D300 Tamron 17-50mm @ f/8 ISO 200 1/200th - Strobist: SB-800 to frame left & SB-600 to frame rightThis was actually the first shot of the evening, everyone together in a large group shot by the sea grass. Even in this type of shot I encouraged some overlap getting everyone to sit as close to each other as possible to show more emotional connection between the family.